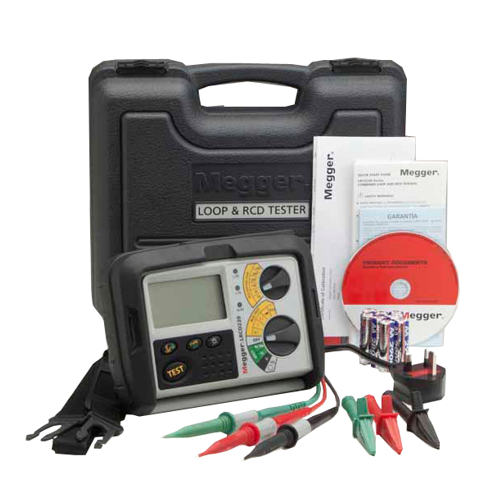 The Megger LRCD200 series is the latest generation of combined non-tripping loop tester and RCD test instruments that provide simple, affordable and flexible test tools for electrical contractors testing energised circuits. All Megger LRCD200 series instruments are supplied with a calibration certificate. This instrument provides 3 phase safe non trip loop testing and 1xI tests of 10mA to 500mA RCDs. Suitable for applications outside the UK only. This instrument provides three phase safe non-trip loop testing and 1/2I, I, and 5I RCD testing for standard, selective and DC RCDs. Suitable for domestic installers testing to UK Part P requirements. As the LRCD210 with the addition of 2 wire fast testing, plus phase to phase and phase to earth measurement. greater during loop testing, even electronic RCDs.